We're Sewing Springville! 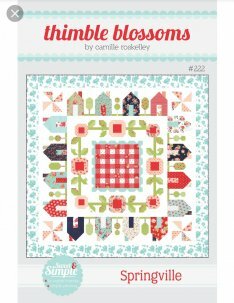 Join us as we sew Thimble Blossoms' Springville Quilt together in Springville, UT! This isn't the first time you've heard me talk about how my husband repeatedly wins my quilt-making heart but he's done it again! The two of us recently embarked on road trip to beautiful Colorado and back again. Why? Just to get away. We drove and drove and drove which means I stitched and stitched and stitched. He knows how much I love bringing some wool applique on the road and enjoys driving long distances while we both take in the sights. We made our way through Cortez and Durango and up into the mountains through Telluride. 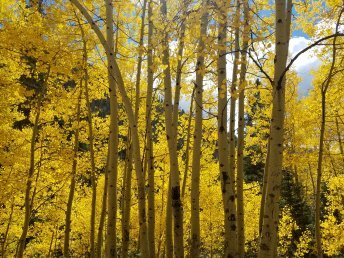 We've decided our dream home might be in Ouray. Have you been there? STUNNING. Everything about it is picturesque and so peaceful. Our timing was perfect for enjoying autumn leaves. The scenery was ever changing as we wound through canyons, around rocky peaks and down into leafy valleys. My husband noted that I should have brought some quilts to photograph... he knows me so well. He is after all, the man whose hands can be seen at the top of so many quilt pictures (have you seen the social media hashtag #husbandsholdingquilts ? It's awesome and my husband's hands are documented there among hundreds of others). As if that wasn't enough to set my heart alight, he went ahead and looked up local quilt shops and asked which I'd like to visit first! Hands off, ladies! He's all mine! I chose two and he was content to walk the dog while I browsed each store. It's always a joy making new quilt friends while on the road and fun to experience the flavor of each new shop along the way. I came home fully refreshed with new inspiration. I couldn't have dreamed up a better travel companion. Here's a snapshot from the road - - the only thing lacking - - a quilt! I may not have captured any quilts while driving through the rockies but when I arrived back at the shop, Chris Chamberlain had finished this beautiful Mountain Top quilt! 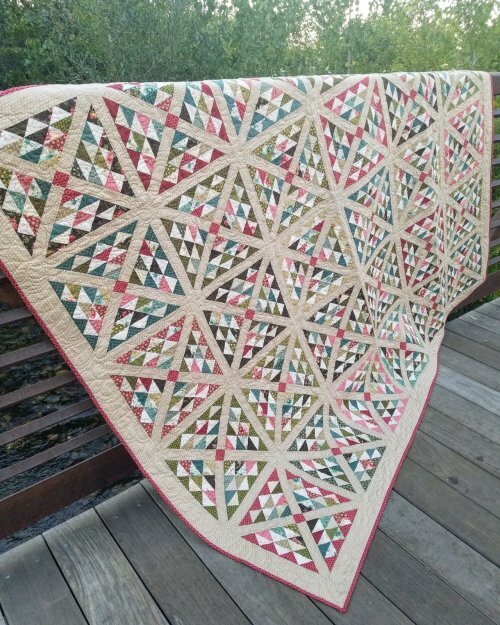 Designed by Edyta Sitar of Laundry Basket quilts featuring her Sequoia fabric collection, this 79" x 94" quilt is a classic. We currently have kits as well as this beautiful fabric line in stock at the shop! Saturday, October 27th - - 1:00-7:00 p.m.
From the moment we saw it, we knew we had to do something special. Have you seen it? The SPRINGVILLE quilt by Camille Roskelley is absolutely darling and we think the name is especially great. We invite you to join us as we sew Springville together here in Springville, Utah! Purchase a kit at the shop or just the pattern and pull together your own fabric combo, cut it out and bring it to our retreat center to sew while celebrating Springville. Although this is not a class, Julie Hancock will be available to help lend advice and trouble shoot. Jen Tanner will share some hometown trivia and even share a bit about the history of quilting here in Springville but most of all we’ll enjoy time with our community of quilters as we sew Springville! Register on our website or at the shop while there are still seats available! 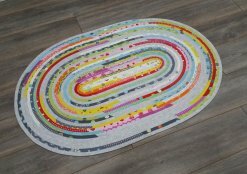 Roma Lambson, designer of the Jelly Roll Rug will be coming to Corn Wagon this Saturday, October 13th, 10am - 1pm! We can’t wait to learn her technique for sewing up those adorable 30” x 44” rugs using a jelly roll and cotton batting strips. Some prep before class means you will have the chance to finish your rug with Roma’s help in class. Monday, October 15th - 25% off FLANNEL including all regular price flannel yardage and hemstitching kits! Thursday, October 18th - - 5:00-8:00 p.m. 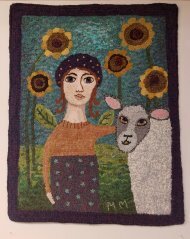 Learn the art of primitive rug hooking while creating one of these beautiful “rugs.” Your project can be made into a wall hanging, pillow, table topper, or a rug for the floor. Choose from among a variety of complete kits available in the shop. Register on our website or at the shop. The UFO number for October is 8.